As the largest supplier of shrub willow planting stock in the United States, Double A Willow is a critical link between research and the commercial development of renewable energy. Double A Willow owner, Dennis Rak, with some of his original plantings. Double A Willow in Fredonia, New York, is the main source of shrub willow planting material for biomass energy and other uses in the United States. Owned by Dennis and Sue Rak, its nursery produces willow planting stock for landowners, institutions, and companies in the bioenergy industry. The planting stock, in the form of dormant stem cuttings, comes from hybrid cultivars developed through breeding programs and research trials at the State University of New York School of Environment and Forestry (SUNY-ESF) and Cornell University. As such, Double A Willow is an essential link between research and the larger renewable energy industry. Double A Willow employees plant nursery blocks with its Egedhal planter, specifically designed to plant willow. Photo: SUNY-ESF. When planted in properly prepared ground, dormant shrub-willow stem cuttings from one-year-old plants produce new roots, stems, and leaves and grow into a new plant. This makes propagation of new willow plants that are genetically identical to the hybrid cultivars from which they were sourced relatively quick and easy compared to planting a rooted shrub. The hybrid cultivars are bred for traits such as fast growth, high biomass yield, and disease and pest resistance. Double A grows about 150 acres of willow at its Fredonia nursery. In addition to selling the willow stem cuttings, the company helps customers establish willow plantings and does custom planting and harvesting. 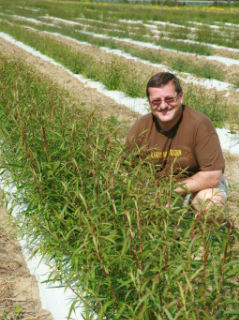 For the last decade, Double A Willow has been the only commercial nursery licensed to grow and distribute hybrid shrub willow cultivars developed and patented by SUNY-ESF. Growers sign a license agreement with Double A for the right to raise the willow varieties for commercial use. The majority of Double A’s willow cuttings destined for bioenergy are growing on 1,200 acres in northern New York, operated by Celtic Energy. Willow biomass from these plantings is being sold to ReEnergy Holdings LLC, which is using willow and other sources of woody biomass for renewable power and heat in converted coal-fired power plants in the region. With the continued funding under the 2014 Farm Bill of the USDA Biomass Crop Assistance Program (BCAP), Dennis Rak hopes there will soon be the opportunity to plant more willow in New York. Double A Willow planting willow at Colgate University, Hamilton, New York. Photo: SUNY-ESF. 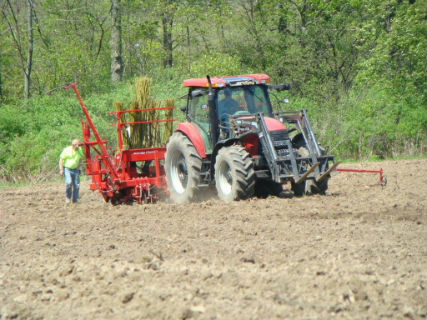 The East Lycoming, PA school district planted 50 acres of willow for a biomass boiler that replaced an oil-fired heating system and is saving the school money. Vernon-Verona-Sherrill High School in Verona, NY, established 2.5 acres of willow to use for fuel in maple syrup production. Traxys, a multinational company that deals in metals and mining, planted 30 acres of willow in northern Michigan as part of a project to convert coal-burning plants to biomass. Colgate University in Hamilton, NY, planted a seven-acre plot of willow for potential fuel in its campus central-heating facility. Riding out the volatility of the energy business is one requisite for today’s producers growing commercial biomass feedstock. With the price of fossil fuels so low at present, current demand for willow bioenergy plantings is also low. Meanwhile, Double A Willow is providing cuttings and support for other promising uses of shrub willow, such as pellet feedstock and highway snow-fence. 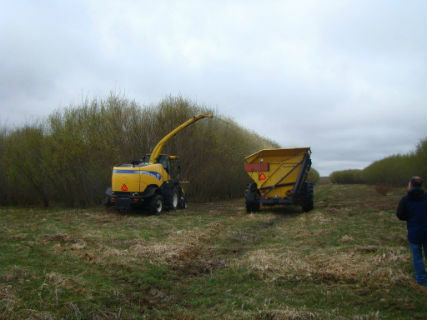 An innovative single-pass cut-and-chip system being used to harvest willow in western New York. Photo: SUNY-ESF. The New York Department of Transportation is growing living willow snow fences along highways to hold back blowing snow, reducing the cost of highway maintenance and improving road safety. Willow is being increasingly used for streambank restoration, such as in a project that helps protect the water quality of Chautauqua Lake in New York State. A sub-licensee in Vancouver, Canada, is working with the city of Calgary on wastewater treatment. Called phytoremediation, the operation includes 1,500 acres of willow plants that will filter out pollutants; the willow will then be harvested and burned as fuel. On a smaller scale, the Raks have sold willow cuttings to be grown for privacy fences, for making baskets and ornamental items, and for sculptures (Patrick Dougherty of Stickwork used Double A’s willow for an installation at the University of Pennsylvania’s Morris Arboretum). Rabbit feed is another potential use: Double A Willow has tested several varieties of willow on rabbits raised for meat. It turns out that the rabbits have a definite preference for certain willow varieties. 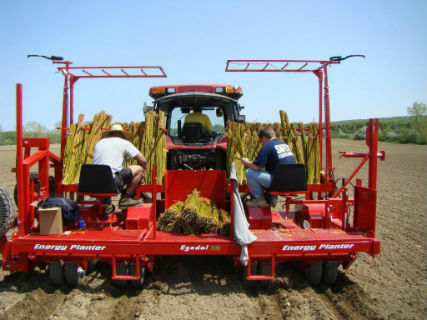 Double A Willow is making the establishment of willow plantings easy and cost-effective for growers, whether they are property owners or producers looking to diversify their land use, or power plants looking to a future of renewable energy. Shrub Willow, NEWBio Energy Crop Profile. Willowpedia: A Willow Energy Crop Information Resource at Cornell University.